A pretty lady wearing a #SMWLagos tee came up with a microphone to announce the grand opening of the Africa NXT stage 2019 to attendees at noon. She teased attendees by naming several acts then told them to expect many more to come. From crate couches with fluffy ankara cushions, to art walls where attendees engaged their inner artisan, the Africa NXT hall is flanked by Firstbank mobile banking stall to the left upon entrance. At the Gulder stand, handsome men in white polo shirts advocate for drinkers to imbibe responsibly while relaxing. The ever-cheerful Happy Coffee houses a little display of drinks and books. A little birdie spoke about them having vodka and Bailey’s spiked coffee drinks. A stop was made at the mechanical energy operated smoothie bar called Bike and Blend. 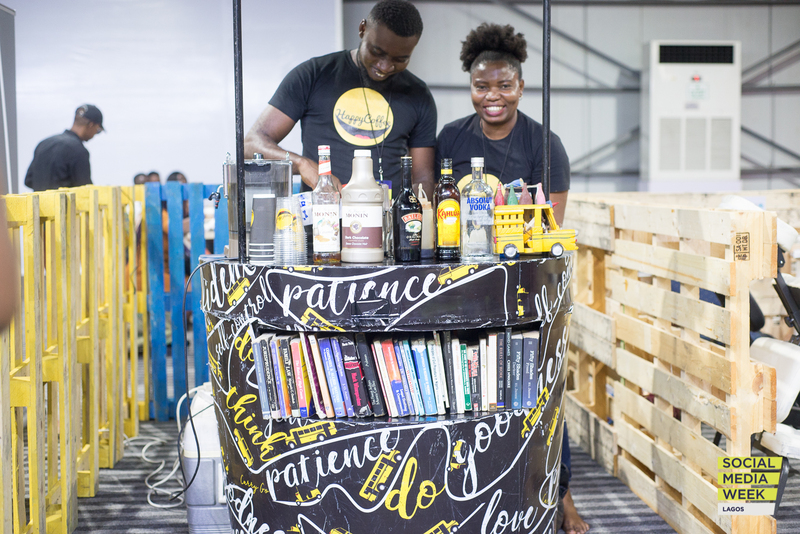 The CEO, Gideon, took us on a tour of their operations which involved using a readily available bike with a blender mounted on top. Foodician was not left out with their signature fried spaghetti and stewed chicken. For home made tasty dankoowa, Krusty Kully got you with free samples *winks. * The outstanding Nascogrills brought their mini production team for barbecued meat served with ketchup and fries. If you need a conference break, On to Spa is a pop up massage parlour for stressed attendees who need a quick pampering. And finally, for the natural hair lovers, make sure you visit the Natural Hair Rocks stand. Flour nuts leaves one with a buttery and fulfilling after taste when their chinchin is eaten. Whatever you do during #SMWLagos 2019, make sure you visit the Africa NXT hub to engage your aesthetic side.